Acer B6 Series B196L 19 inch LED Monitor 1280 x 1024 Res, Internal Speakers, 5ms. Brand new Sealed Unit, Official UK Stock, Full Manufacturer Warranty . Fast Delivery M-F.
Pivot the screen to a vertical view. B6 Series monitors combine professional style with ergonomic design to suit all environments and viewing demands. Acer eColour and ComfyView technologies make every pixel colourful and clear. Intelligent construction details have earned these monitors EPEAT Gold ranking and TCO 6.0 product certification. However you like to work or play, the B6 series has been designed to fit into your life. 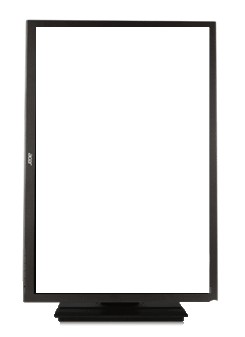 The Acer ErgoStand offers an ideal situation for all workstations. The stainless steel constant force spring supports simple monitor height adjustment of up to 150mm, ensuring the monitor is at a comfortable height at any desk level. For fast vertical viewing, the B6 monitor can switch easily from horizontal to vertical and the working angle of the screen display can be adjusted from -5° to 35° to ensure comfort, especially during sustained use. 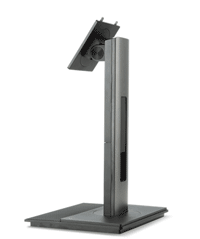 It is also easy to share what's on your screen with friends or colleagues as the ErgoStand allows you to swivel the screen up to 120°, providing more viewing angles without moving the base. What's more, the round mark and baseline ensure an easy return to the original position. Want to mount your monitor on the wall? An easy-release button at the back of the monitor makes changing its location from stand to wall effortless. Simply press the release button. Control the panel with an on-screen display (OSD) button. 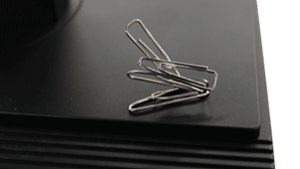 The magnetic section of the base tidies up paperclips. The B6 series conveniently allows you to keep office essentials at hand while avoiding clutter and mess. 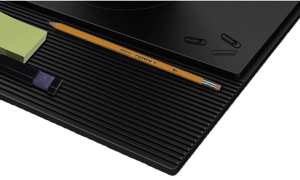 The base features a magnetic corner which tidies up paperclips, while the grooved tray offers convenient access to pencils, pens, USB devices and more. What's more the simple yet sleek design suits most offices and rooms. For ease of use, the on-screen display (OSD) button is accessible at the bottom of the bezel for optimum panel performance control. Need to view files on your smartphone on a bigger screen? B6 series monitors are designed with Mobile High-Definition Link (MHL) technology via the HDMI port. Simply connect your smartphone, tablet or mobile device to the HDMI port and you can simultaneously display files from your device on the monitor too. What's more, it even charges the device at the same time. The LED monitor delivers excellent detail, making it ideal for gaming, multimedia and productivity applications, providing advantages such as Blu-ray Disc console gaming or widescreen cinematic playback. Keep essentials tidy with the base stationary tray. USB 3.0 connectivity transfers data to and from external devices up to 10 times faster than USB 2.0, taking advantage of capabilities supported by many devices. With more bandwidth available, you'll be able to enjoy higher delivery speed and better performance while transcoding or sharing information. You'll also be able to charge your mobile devices even when the computer is switched off -- simply plug your mobile devices into the USB 3.0 port and you'll be able to charge them without the need to turn on a PC. Acer ComfyView Display technology reduces unnecessary glare. A single button -- the Empowering Key -- grants full access to the Acer eColour Management onscreen interface. Acer eColour Management provides a variety of advanced controls for achieving the best-possible image quality. 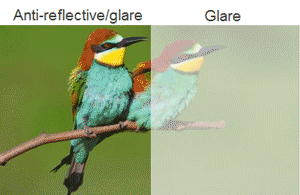 This feature allows you to quickly tailor the performance characteristics (brightness, saturation, contrast, etc.) of your monitor to best suit the visual content. Acer eColour Management, which includes a set of convenient scenario modes, is the result of comprehensive research to reveal the most-sought-after features in high-end monitors. Psychological and technological studies were also undertaken to determine the best method of implementing those features. Text mode -- Suited for onscreen viewing and editing of documents, spreadsheets, etc. No more screen reflection from lighting thanks to the Acer ComfyView Display technology. View what's on screen without glare, as the polariser material reduces the amount of unnecessary light reflection -- meeting the ergonomic workstations requirement. Thanks to Acer Adaptive Contrast Management (ACM), this monitor delivers a 100 million:1 contrast ratio. ACM optimises contrast to deliver the highest level of clarity and detail by analysing every scene, adjusting images frame by frame, and enhancing detail and gradation. Advanced technology enables a dramatic improvement of gradation and detail, especially in very dim or very bright scenes, for stunning picture quality. What's more, with ACM, the LCD monitor uses less power and saves energy. Acer monitors using LED backlight technology minimise environmental impact while offering superior performance and durability. White LEDs do not contain the toxic substance mercury, making them safer for the environment. White LEDs also consume less power and are more durable than CCFL lamps, minimising environmental impact and resulting in up to 68% power savings. Acer B196Lymdr - LED monitor - 19"